This is another post brought to you by the Cricut Design Space Star Finals. 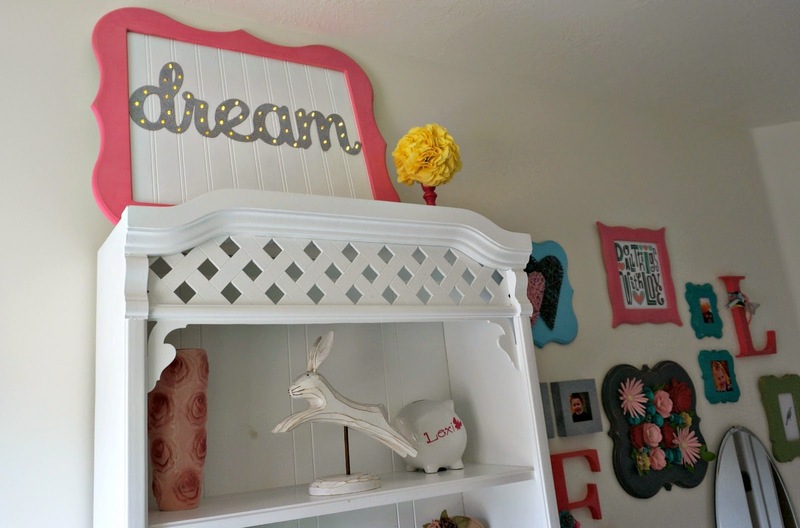 This week I revealed the full makeover I did on my girls' room as my final project in the Cricut Design Space Star contest. And this is the first of many projects I'll be sharing with you over the next few days. 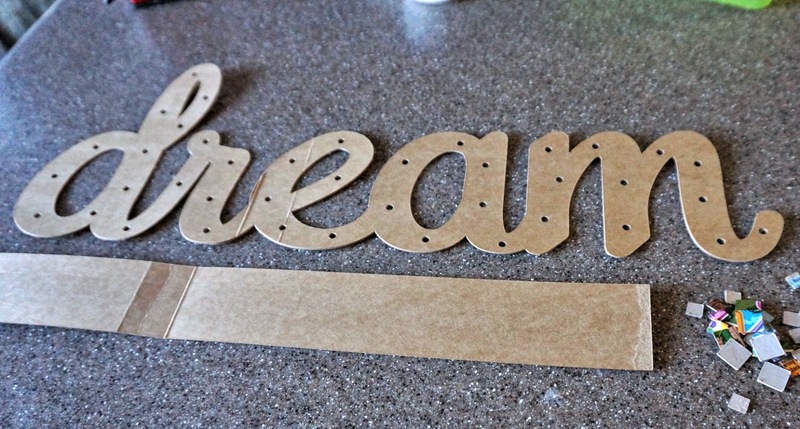 The first step in creating this project is selecting your word and cutting it out on your Cricut Explore. I used a pizza box to create my base layer. - you might need to separate the letters to adjust one or two to line up on the bottom (if that's the look you're going for) After my letters were touching, I separated them and shifted the letter "r" up a bit so it lined up with the other letters. - once you are happy with the alignment and spacing, select all the letters and select the weld button, this will create one single shape. Once your word is ready, you will want to place the holes for the lights. I did this before I cut the word out. I measured the diameter of the lights I wanted to use and created a circle that size in Design Space. I copied that circle 40 times (that is how many lights I had) and then placed them on the word where I wanted them. It was nice to be able to play with the spacing and move things around as needed. Then I cut it out. Spray the word with the glitter spray paint. This was my first time using it and it was awesome! 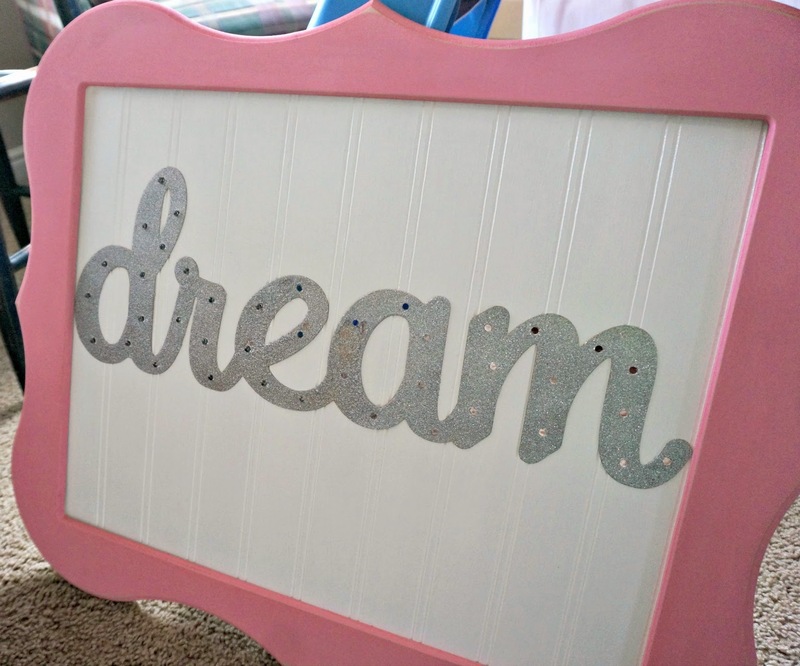 I only had a small can though, and it doesn't cover all that much- so I would probably paint the word gray first before adding the glitter if I had to do it again, but- it covered well enough and I'm really happy with it. Finally, paint the frame your color of choice. I used two coats of acrylic paint and then sanded it just a bit to distress it. Once all the pieces are dry, assemble your sign. 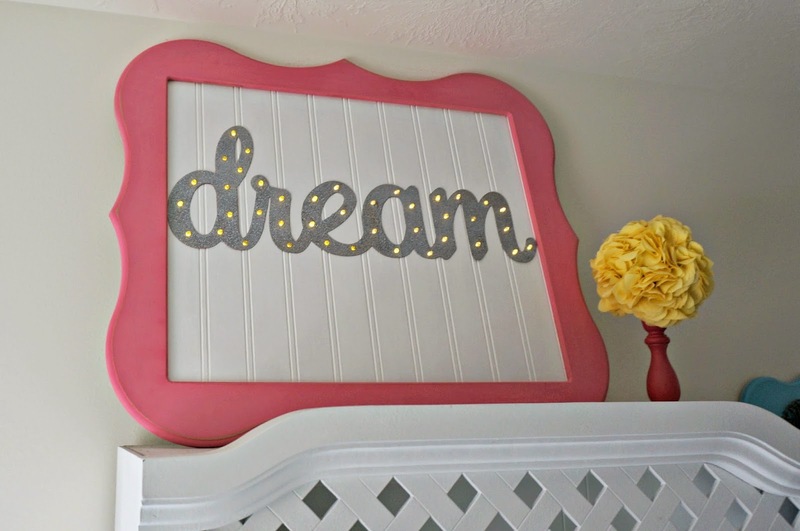 Make sure to line up all the holes on the word and the bead board. I used spray adhesive on my word to make sure it would stick all over to the sign and that I didn't miss any edges or corners. The last step is to add the lights. 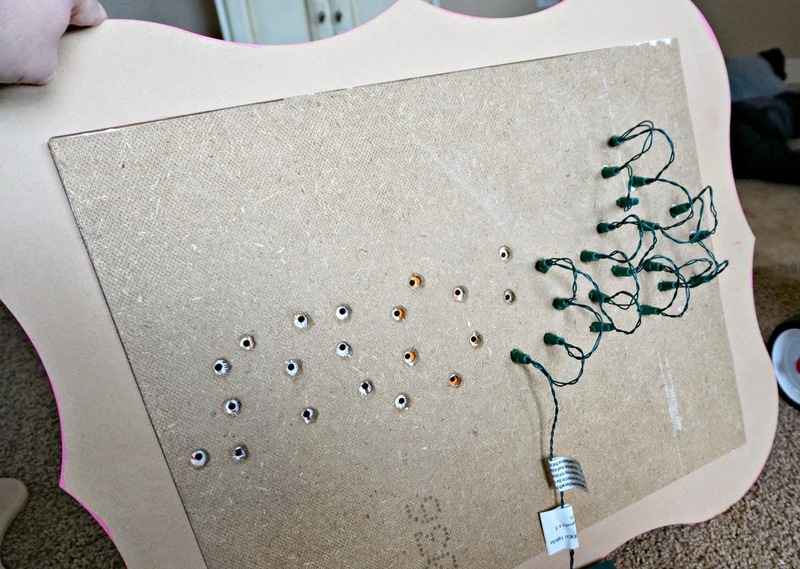 You can see better what I mentioned earlier about drilling the holes in the bead board larger than the holes for the lights. The holes in the word were just tight enough to securely hold the lights in without having to use anything else, but if your holes are a bit too big, you can always use tape to hold the lights in place. I used duct tape to attach the battery packs to the back of the sign so they weren't hanging loose. These lights have a timer options where they go on for 6 hours and go off for 18. It makes it a perfect option for a night light, I have it go on at 6 and off at midnight and it allowed me to place it high on their hutch without having to worry about turning it off and on. This sign is actually pretty big. I think it's probably an 18" X 20" frame. The lights cast a really soft glow in the room at night, not too bright, but enough that the girls feel safe and secure. It's probably one of my favorite pieces in the room. I'm really glad I didn't give up on this project and that my sister came along to rescue me just in time. Linked up to Show and Tell 152.